The Lease Container operation establishes and manages a lock on a container for delete operations. The lock duration can be 15 to 60 seconds, or can be infinite. Acquire, to request a new lease. Renew, to renew an existing lease. Change, to change the ID of an existing lease. Release, to free the lease if it is no longer needed so that another client may immediately acquire a lease against the container. Break, to end the lease but ensure that another client cannot acquire a new lease until the current lease period has expired. The Lease Container operation is available in version 2012-02-12 and newer. To specify the root container, enter $root as the container name. x-ms-version Optional. Specifies the version of the operation to use for this request. For more information, see Versioning for the Azure Storage Services. x-ms-lease-id: <ID> Required to renew, change, or release the lease. The value of x-ms-lease-id can be specified in any valid GUID string format. See Guid Constructor (String) for a list of valid GUID string formats. x-ms-lease-action: <acquire &#124; renew &#124; change &#124; release &#124; break> acquire: Requests a new lease. If the container does not have an active lease, the Blob service creates a lease on the container and returns a new lease ID. If the container has an active lease, you can only request a new lease using the active lease ID, but you can specify a new x-ms-lease duration, including negative one (-1) for a lease that never expires. renew: Renews the lease. The lease can be renewed if the lease ID specified on the request matches that associated with the container. Note that the lease may be renewed even if it has expired as long as the container has not been leased again since the expiration of that lease. When you renew a lease, the lease duration clock resets. change: Change the lease ID of an active lease. A change must include the current lease ID in x-ms-lease-id and a new lease ID in x-ms-proposed-lease-id. release: Release the lease. The lease may be released if the lease ID specified on the request matches that associated with the container. Releasing the lease allows another client to immediately acquire the lease for the container as soon as the release is complete. break: Break the lease, if the container has an active lease. Once a lease is broken, it cannot be renewed. Any authorized request can break the lease; the request is not required to specify a matching lease ID. When a lease is broken, the lease break period is allowed to elapse, during which time no lease operation except break and release can be performed on the container. When a lease is successfully broken, the response indicates the interval in seconds until a new lease can be acquired. A lease that has been broken can also be released. A client can immediately acquire a container lease that has been released. x-ms-lease-break-period: N Optional. For a break operation, proposed duration the lease should continue before it is broken, in seconds, between 0 and 60. This break period is only used if it is shorter than the time remaining on the lease. If longer, the time remaining on the lease is used. A new lease will not be available before the break period has expired, but the lease may be held for longer than the break period. If this header does not appear with a break operation, a fixed-duration lease breaks after the remaining lease period elapses, and an infinite lease breaks immediately. x-ms-lease-duration: -1 &#124; N Required for acquire. Specifies the duration of the lease, in seconds, or negative one (-1) for a lease that never expires. A non-infinite lease can be between 15 and 60 seconds. A lease duration cannot be changed using renew or change. x-ms-proposed-lease-id: <ID> Optional for acquire, required for change. Proposed lease ID, in a GUID string format. The Blob service returns 400 (Invalid request) if the proposed lease ID is not in the correct format. See Guid Constructor (String) for a list of valid GUID string formats. Acquire: A successful operation returns status code 201 (Created). Renew: A successful operation returns status code 200 (OK). Change: A successful operation returns status code 200 (OK). Release: A successful operation returns status code 200 (OK). Break: A successful operation returns status code 202 (Accepted). ETag The ETag for the container. This header is returned for requests made against version 2013-08-15 and later, and the ETag value will be in quotes. Lease Container operations made against version 2013-08-15 and later do not modify this property, but prior versions will. Last-Modified This header is returned for requests made against version 2013-08-15 and later. Returns the date and time the container was last modified. The date format follows RFC 1123. For more information, see Representation of Date-Time Values in Headers. Any operation that modifies the container or its properties or metadata updates the last-modified time, including setting the container's permissions. Operations on blobs do not affect the last-modified time of the container. Lease Container operations made against version 2013-08-15 and later do not modify this property, but prior versions do. x-ms-lease-id: <id> When you request a lease, the Blob service returns a unique lease ID. While the lease is active, you must include the lease ID with any request to delete the container, or to renew, change, or release the lease. A successful renew operation also returns the lease ID for the active lease. x-ms-lease-time: seconds Approximate time remaining in the lease period, in seconds. This header is returned only for a successful request to break the lease. If the break is immediate, 0 is returned. A lease on a container provides exclusive delete access to the container. A container lease only controls the ability to delete the container using the Delete Container operation. To delete a container with an active lease, a client must include the active lease ID with the delete request. If the lease ID is not included, the operation fails with 412 (Precondition failed). All other container operations succeed on a leased container without including the lease ID. The lease is granted for the duration specified when the lease is acquired, which can be between 15 seconds and one minute, or an infinite duration. When a client acquires a lease, a lease ID is returned. The Blob service will generate a lease ID if one is not specified in the acquire request. The client may use this lease ID to renew the lease, change its lease ID, or release the lease. The following diagram shows the five states of a lease, and the commands or events that cause lease state changes. 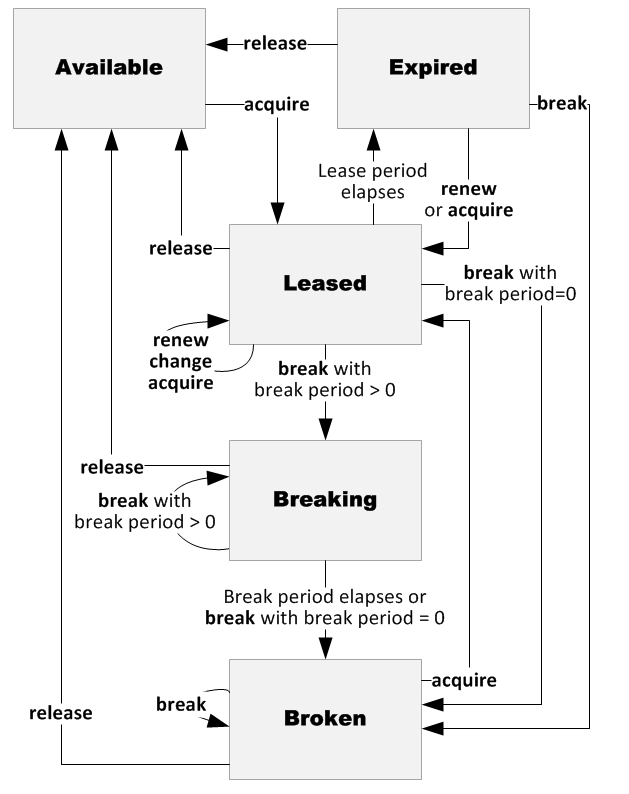 The following diagram shows the five states of a lease, and the commands or events that cause lease state changes. A lease can be in 5 states, based on whether the lease is locked or unlocked, and whether the lease is renewable in that state. The lease actions above cause state transitions. Available, the lease is unlocked and can be acquired. Allowed action: acquire. Leased, the lease is locked. Allowed actions: acquire (same lease ID only), renew, change, release, and break. Expired, the lease duration has expired. Allowed actions: acquire, renew, release, and break. Breaking, lease has been broken, but the lease will continue to be locked until the break period has expired. Allowed actions: release and break. Broken, lease has been broken, and the break period has expired. Allowed actions: acquire, release, and break. The lease ID is maintained by the Blob service after a container lease has expired. A client can renew or release their lease using their expired lease ID. If the client attempts to renew or release an expired lease with their previous lease ID and the request fails, the client then knows that the container was leased again or deleted since their lease was last active. If a lease expires rather than being explicitly released, a client may need to wait up to one minute before a new lease can be acquired for the container. However, the client can renew the lease with the expired lease ID immediately. The container's Last-Modified-Time property is not updated by calls to Lease Container. The following tables show outcomes of actions on containers with leases in various lease states. Letters (A), (B), and (C) represent lease IDs, and (X) represents a lease ID generated by the Blob service.